This is the menu for Import database . For a description of the buttons please scroll down. : It will open a menu for Mangement of class,pupil,teachers ,Attendence of pupils and teachers etc. : It will open a menu for Managing Bank account Like Defining Account,changing Balance etc. : It will open a menu for setting your own tables for courses,Holidays,Semesters etc. : It will open a menu for printing Marks,Pupil ,Course Teachers,Teaching Duration etc. : It will Open a window for adding ,deleting users. : It will Open a menu for giving details about school like licence,school parts etc. : It will Open a menu for promoting children to higher classes,by both pupil wise andclass wise. : It will a window for giving option to Import/Export Solstar(another product of Heneke Software). : It will open a window to import from Microsoft Access). : It will open a window to import from Dbase. : It will open a window to import from Excel. : It will open a window to have turbo planner for time table management . : It will open a window to export courses of pupils to database. : It will open a window to export the timetable to database. : It will open a window to export marks of pupils to database. : It will open a menu giving export/import options for teacher data. 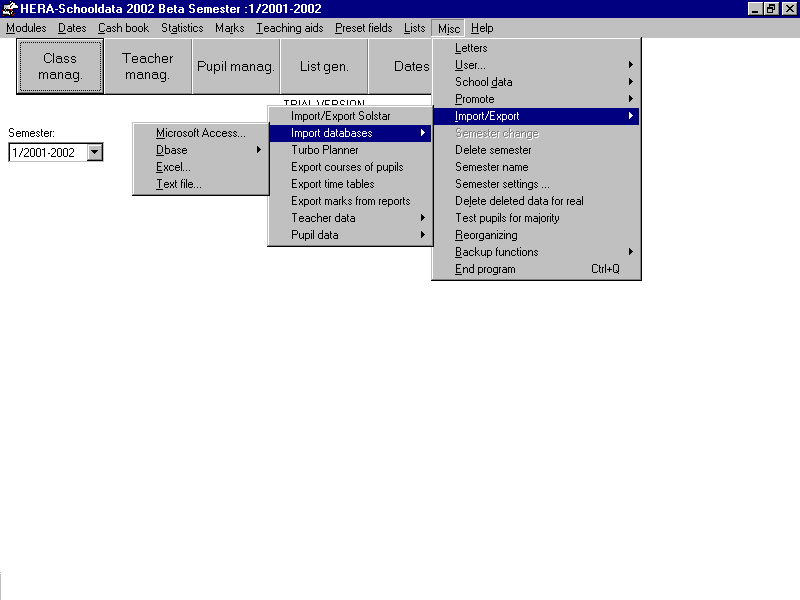 : It will open a menu giving export/import options for pupil data. : It will open a window to change semester setting(disabled here). : It will open a window for to confirm to delete the data from database. : It will open a window for testing pupil for majority. : It will open a window for reorganize the data in database. : This main menu has options for Backup of data .